I am not known to be a big joker. In fact, it is a big joke to a lot of very close friends how serious a person I am. So imagine my apprehension when I discovered that joking around and pretending with your kids is supposedly a good thing for their development. So, before I started to panic in a major way and blame myself for the millions of moments I missed out adding to their better development by not being a joker, I decided to look into this and see what I missed out on doing, if I missed anything at all even. …that joking and pretending by parents with their toddlers were important in building children’s social skills, learning and creativity. Wow! I was beginning to feel really inadequate. Apparently, I missed out on doing something completely free that was supposed to give them this kick start in life skills! The target age was 15-24 months and my kids have long passed that mark so did that mean it was too late to start this method of development? Luckily, upon deeper reflection, it turns out that I am not the humorless rock I have always believed myself to be after all. Research says that making jokes and pretending when doing things helps kids recognize these concepts, the difference between the concepts, and helps them become more creative, have more humor, promotes sociability, and thinking out of the box. And it isn’t really too hard. I remember there were so many instances where I was cleaning out a closet or a bag or a box of toys with my two kids and then I would ask them where things would go and they would tell me one place and I would “mistakenly” put it elsewhere. They would laugh and call me out, and I would gasp with appropriate surprise, and this would send them into fits of giggles over how silly mommy was being. Other things I would do would be to sing their favorite songs and change up the lyrics, all the time innocently looking at them as if I was singing the correct thing. This again would send them into gales of laughter. These are just a few of the things I recall doing, so I am not too panicked that I have deprived them of jokes and pretend play since birth and at present. Have I noticed anything extraordinarily different in the development of my kids? Well, honestly, the non-biased answer is not really. They seem to me the way normal, adjusted, developing, intelligent, happy kids should be. I will say that my son loves to make stories up in drawing and sings while explaining his drawings, and my daughter really loves mixing things up as a joke. Is that normal? I am guessing so. Is it great to see them love to laugh and to know that they get some of that from their staid and serious mom? It sure is. What do you think about humor as a teaching tool? Is Black Friday Worth the Hype? I have ventured out on Black Friday a time or two. The first time I ever did this was during the Furby craze! These annoying little robotic toys were all the rage during Christmas season 1998 or 1999. I didn’t have children at the time but one of my BFFs did. These chatty creatures were in such high demand that each customer was only allowed to purchase one at a time — and my friend had two kids. I thought it would be fun adventure to get out there with all the other bargain hunters — plus, I wanted to help my friend. So we met at a department store at 3:30am the day after Thanksgiving. Well, we got our Furbies but it was pretty wild out there. My friend and I made our Black Friday outing an annual tradition for about 4 years. I think the only other super great deal we got was a Barbie Dream House for her daughter, which was normally $100 and I think it was on sale for $40. Even though we were far from the front of the line we got it and it was worth it — her daughter was thrilled on Christmas morning. Is Black Friday really worth the hype? For many people the answer is yes. For me? The answer is yes and no. Sure there are great deals to be had but you have to to get up ridiculously early to even have a chance at some of the hottest items. I’m not saying you won’t save money because you will, as long as the items you go out for are still in stock by the time you get there. Retailers leure you into their stores with promises of crazy low prices on specific items but they usually only have a few of these items in stock. So let’s say that you see a 32″ HD TV advertised for only $99. If you are one of the very first people at the front of the line you have a good chance at getting this item. The bad news is, you may have to skip the pumpkin pie to start standing in line before the sun even sets on your Thanksgiving Day. Online retailers take notice of Black Friday sales and the folks at Amazon.com are constantly dropping their prices to one up other retailers. So if you don’t want to wait out in the freezing cold or throw elbows with the big boys and girls, you might just want to start shopping early and do some research so you can find the best deals on and offline. Another great thing is that a lot of stores today will price match competitors if you have the ad with you. This can help save you time and money. Now for the record I’m not saying shopping on Black Friday is a bust. I do like to hit the stores after I have slept off the tryptophan from the day before and had a few cups of coffee. I usually get out around 10-11am. By this time the crazy has settled and there are still a few Early Bird Specials to be had. Look at the ads and decide which stores and what deals you want to take advantage of. Write it down! Bring those too. 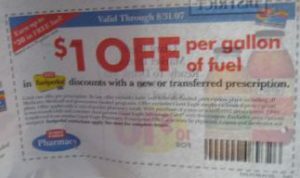 There are often retail coupons, which you can find online that can be used in addition to sale prices but read the fine print just to be sure. Have fun! Make a plan to shop till you drop, then meet friends for breakfast or lunch. This can help you de-stress. Plus, it’s fun to compare deals. 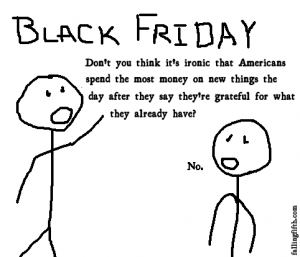 What do you think about Black Friday? Are you a die hard shopper or do you stay away from the stores as much as possible on that day? I don’t want to brag or anything but I’ve got to tell you that our electric bill has been very low for the past four months or so. It had nothing to do with me though. Here in the Pacific NW we had a fairly cool summer, which for some people was a huge bummer — but not for me. I don’t like being too warm anyway and even if I did, I sure couldn’t balk at the fact that we only had to use our air conditioning for one or two weeks total! We have also had a nice fall. Not too cool and not too terribly rainy, so I actually didn’t even turn our heater on for the first time until a few weeks ago! Again, our electric bills have been outstanding and instead of dreading the bill, I’m actually excited to see how low it is (I know that sounds a little weird but it’s true). Ah, but those glorious days are quickly coming to an end as we enter the colder months. I am so sad to say goodbye to low electricity bills but do I really have to? Maybe not. I have been thinking about ways to cut our heating costs so if nothing else, they don’t get as high as they did last year! I don’t know about you but on our bill, the power company provides a side by side comparison of the current month and how much energy we used in the same month the year before. My goal this year is to try to improve on last year’s electrical costs. It always seems like we do worse and worse each winter but no more! Having a goal (and making a game out of it) is very motivating for me. So yes — once again, I accept my own challenge! Listen, I am pretty much always cold but we keep our thermostat at a cool 68 degrees. If I’m too chilly I put on a sweater or something. It’s amazing just how much money you can save by knocking the temp down a few notches. This can be in your attic, crawl spaces, walls and around hot water heater and pipes. If your hot water heater is inside your house it isn’t an issue but if your water heater is in the garage it is. Wrap insulation around your water heater and around the pipes so the water heater doesn’t have to work harder to keep the hot water hot. Another thing we learned when we had to replace our water heater is that you can get a foam disk that sits between the cold cement garage floor and your water heater which helps quite a bit as well. For many people windows and doors are the main culprits of energy wasters. If you don’t have the money to replace windows and doors with energy efficient ones don’t worry, there are still some things you can to to help keep your heat in. Using thermal insulated curtains or liners on your windows can help cut heating costs. I also found a helpful how-to video from Home Depot about how to seal your windows and doors to prevent the cold air from leaking in. Purchasing a door and window draft blocker can be helpful in keeping your home warm and your heating costs low. 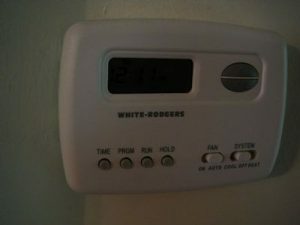 What are some ways you winterize your home to keep heating costs down? In the Philippines, Halloween is not such a big deal. It is considered a more Western tradition and is thus not really given all that much attention. Sure, it answers our inner need for dramatics and our seemingly inherent sweet tooth but, on the whole, the day and the event go by with not too much fanfare. That doesn’t mean nothing happens at all. In some villages in the suburbs, the association organizes a village trick or treat event which give the kids (and the parents!) the opportunity to dress up in their most creative costume. This is one part of what a lot of those involved find fun. Here, not every costume needs to be scary. In fact, dressing up like your favorite super hero or your favorite childhood character is more than enough. You will see the simplest Casper costume, to the elaborate Jesse of Toy Story, to any of the Disney Princess, to Ben 10, Justice League, even Thomas the Tank Engine! It really is that time to let the imagination run free. But it isn’t just about getting all dressed up. This is just a part of the fun as was mentioned earlier. Another big part of the fun is dressing up your home’s entrance for the visiting ghosts, witches, princes and princesses. Since the kids and accompanying guardians don’t really go beyond your front door, all care is taken to dress up this block of wood, any front-facing window, or even the smallest patch of garden or front lawn. For single moms like me, the cost of dressing the front portion of my home is just an expense that falls far below the list of essential expenses. But I also would like for my kids to experience the trick or treat and dress up fun that really only comes once a year. So it is a challenge for me to allot money towards this event. Here was what I did this year. I decided to decorate my front door and two front windows with spiders, rats, and clay pots. Sounds interesting doesn’t it? Well, I thought it was and really, really easy and inexpensive too! First, I bought 4 packs of these realistic looking rubber spiders (6 to a pack), about ping pong ball size each, for php60 ( 1 USD= 43 PHP by the way), and used super glue to glue white yarn to parts of their body. I then thumb tacked the other end of the yarn to the tops of my door and window frames to make them look like they were hanging down from the top of the door and windows, in the act of perhaps making a spider web. I then bought 2 packs of again-realistic looking rubber rats, black with the red eyes, each about the size of a small empanada and 8 to a pack, for php70, and lined the rodents up on the edges of the windowsills. Finally, I took 2 medium sized clay pots, filled them with some Christmas lights (handy to get these tested for the coming Holidays, too!) and them lightly covered them with orange reflective paper. I didn’t enclose them nor did I place the paper anywhere need the bulbs to avoid creating a fire hazard and I made sure that the lights I used were the outdoor, all-surface ones. This gave off an orange glow. Then I placed the remaining rodents around each pot. These were super cheap, super easy things to prepare and to fix up for Halloween. They are also really easy to put away after. The best part is that I can use these props again next year, for another Halloween design. All in all I spent around less than $15 on everything. 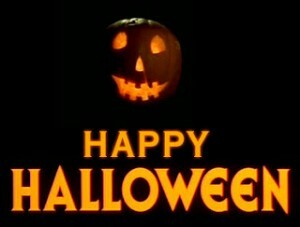 Although Halloween is not a major activity in my country, it is still a day that brings joy to a lot of kids playing dress up, running from house to house, asking for sweets and treats. It feels great to join in on the fun without breaking my wallet. How do you save money on decorating for Halloween?